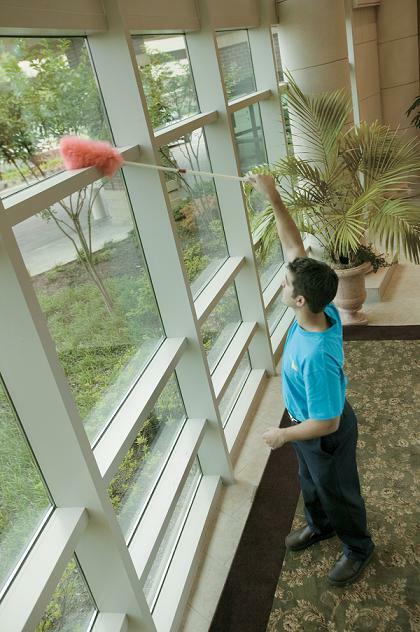 A clean, well-kept facility is essential in projecting a positive image for your business. You strive to provide a healthy environment for your customers and employees. With over 50 years of experience, ServiceMaster Clean® has developed the most advanced cleaning technologies and methods to help businesses all over the world achieve this goal. Compare us to all the others and find out why you should choose ServiceMaster Clean for all your office cleaning needs. In our commitment to doing business the right way and turning ordinary tasks into extraordinary service, ServiceMaster Building Services Management is proud to offer environmentally conscious, green cleaning options for all of your commercial and office cleaning needs. For more information, click here. You can count on ServiceMaster Building Services Management to enhance your image and provide a healthy, well-kept working environment. We are able to service all types of buildings including offices, research facilities, hotels, retail stores, hospitals, public entertainment venues, schools, and even the airline industry. For more information, click here. Whatever your service or scheduling needs, ServiceMaster Building Services Management can tailor a janitorial service or office cleaning plan just for you. Click here to contact us now. ServiceMaster Building Services Management is a proud member of the Better Business Bureau and The Greater Valley Chamber of Commerce. © 2010 ServiceMaster Building Services Management. All rights reserved.